Titanium (chemical symbol Ti, atomic number 22) is a silvery-white, lustrous metal. Light and strong, it is resistant to corrosion, including corrosion by seawater and chlorine. It is used in strong, lightweight alloys (most notably with iron and aluminum), and in powdered form to other materials, such as graphite composites. Its most common compound, titanium dioxide, is used in white pigments. Examples in which white pigment, consisting of titanium oxide, is used, are correction fluid and commonly used white paint to repaint walls. It is also used in toothpaste, white road marking paints, and white fireworks. Substances containing titanium are called titaniferous. The element occurs in numerous minerals with the main sources being rutile and ilmenite, which are widely distributed over the Earth. There are two allotropic forms and five naturally occurring isotopes of this element—46Ti through 50Ti with 48Ti being the most abundant (73.8 percent). One of titanium's most notable characteristics is that it is as strong as steel but is only 60 percent its density. Titanium's properties are chemically and physically similar to those of zirconium. Titanium metal is always bonded to other elements in nature. It is the ninth-most abundant element in the Earth's crust (0.63 percent by mass) and is present in most igneous rocks and in sediments derived from them (as well as in living things and natural bodies of water). It is widely distributed and occurs primarily in the minerals anatase, brookite, ilmenite, perovskite, rutile, titanite (sphene), as well in many iron ores. Of these minerals, only ilmenite and rutile have significant economic importance, yet even they are difficult to find in high concentrations. Because it reacts easily with oxygen and carbon at high temperatures, it is difficult to prepare pure titanium metal, crystals, or powder. Significant titanium ore deposits exist in Australia, New Zealand, Scandinavia, North America, and Malaysia. Large quantities have also been detected in the Kwale region in Kenya, deposits to which a Canadian firm, Tiomin, has mining rights. This metal is found in meteorites and has been detected in the sun and in M-type stars. Rocks brought back from the moon during the Apollo 17 mission are composed of 12.1% TiO2. Titanium is also found in coal ash, plants, and even the human body (while harmless, it is not believed to be an essential element). Because the metal reacts with air at high temperatures it cannot be produced by reduction of its dioxide. Titanium metal is, therefore, produced commercially by the Kroll process, a complex and expensive batch process developed in 1946, by William Justin Kroll. In the Kroll process, the oxide is first converted to chloride through carbochlorination, whereby chlorine gas is passed over red-hot rutile or ilmenite in the presence of carbon to make TiCl4. This is condensed and purified by fractional distillation and then reduced with 800 °C molten magnesium in an argon atmosphere. A newer process, the FFC Cambridge Process, may replace the older Kroll process. This method uses the feedstock titanium dioxide powder (which is a refined form of rutile) to make the end product which is either a powder or sponge. If mixed oxide powders are used, the product is an alloy at a much lower cost than the conventional multi-step melting process. It is hoped that the FFC Cambridge Process will render titanium a less rare and expensive material for the aerospace industry and the luxury goods market, and will be seen in many products currently manufactured using aluminium and specialist grades of steel. Titanium was purified to ultra high purity in small quantities when Anton Eduard van Arkel and Jan Hendrik de Boer discovered the iodide, or crystal bar, process in 1925, by reacting with iodine and decomposing the formed vapors over a hot filament to pure metal. Titanium oxide is produced commercially by grinding its mineral ore and mixing it with potassium carbonate and aqueous hydrofluoric acid. This yields potassium fluorotitanate (K2TiF6) which is extracted with hot water and decomposed with ammonia, producing an ammoniacal hydrated oxide. This, in turn, is ignited in a platinum vessel, which creates pure titanium dioxide. Common titanium alloys are made by reduction. For example; cuprotitanium (rutile with copper added is reduced), ferrocarbon titanium (ilmenite reduced with coke in an electric furnace), and manganotitanium (rutile with manganese or manganese oxides) are reduced. Titanium was discovered at Creed, Cornwall, in England, by amateur geologist Reverend William Gregor in 1791. He recognized the presence of a new element in ilmenite, and named it menachite (alternately spelled manaccanite), after the nearby parish of Manaccan. Around the same time, Franz Joseph Muller also produced a similar substance, but could not identify it. The element was independently rediscovered several years later by German chemist Martin Heinrich Klaproth in rutile ore. Klaproth confirmed it as a new element and in 1795, he named it for the Titans of Greek mythology. The metal has always been difficult to extract from its various ores. Pure metallic titanium (99.9 percent) was first prepared in 1910, by Matthew A. Hunter by heating TiCl4 with sodium in a steel bomb at 700–800°C in the Hunter process. Titanium metal was not used outside the laboratory until 1946, when William Justin Kroll proved that titanium could be commercially produced by reducing titanium tetrachloride with magnesium in the Kroll process which is the method still used today. In 1950–1960s, the Soviet Union attempted to corner the world titanium market as a tactic in the Cold War to prevent the American military from utilizing it. In spite of these efforts, the U.S. obtained large quantities of titanium when a European company set up a front for the U.S. foreign intelligence agencies to purchase it. Indeed, titanium for the highly successful U.S. SR-71 reconnaissance aircraft was acquired from the Soviet Union at the height of the Cold War. By 1956, U.S. production of titanium mill products was more than 6 million kg/yr. Titanium is classified as a transition metal. It is well-known for its excellent resistance to corrosion; it is almost as resistant as platinum, being able to withstand attack by acids, moist chlorine gas, and by common salt solutions. Pure titanium is not soluble in water but is soluble in concentrated acids. A metallic element, it is also well-known for its high strength-to-weight ratio. It is a light, strong metal with low density that, when pure, is quite ductile (especially in an oxygen-free environment), lustrous, and metallic-white in color. The relatively high melting point of this element makes it useful as a refractory metal. Commercially pure grades of titanium have an ultimate tensile strength equal to that of high strength low alloy steels, but are 43 percent lighter. Titanium is 60 percent heavier than aluminum, but more than twice as strong as 6061-T6 aluminum alloy; these numbers can vary quite substantially due to different alloy compositions and processing variables. It is fairly hard (although by no means as hard as some grades of heat-treated steel) and has a tendency to blunt cutting tools. Like those made from steel, titanium structures have a fatigue limit which guarantees longevity in some applications. This metal forms a passive and protective oxide coating (leading to corrosion-resistance) when exposed to elevated temperatures in air, but at room temperatures it resists tarnishing. The metal, which burns when heated in air 610 °C or higher (forming titanium dioxide) is also one of the few elements that burns in pure nitrogen gas (it burns at 800 °C and forms titanium nitride). Titanium is resistant to dilute sulfuric and hydrochloric acid, along with chlorine gas, chloride solutions, and most organic acids. It is paramagnetic (weakly attracted to magnets) and has a very high electrical conductivity and thermal conductivity. Experiments have shown that natural titanium becomes radioactive after it is bombarded with deuterons, emitting mainly positrons and hard gamma rays. The metal is a dimorphic allotrope with the hexagonal alpha form changing into the cubic beta form very slowly at around 880 °C. When it is red hot the metal combines with oxygen, and when it reaches 550 °C it combines with chlorine. It also reacts with the other halogens and absorbs hydrogen. Naturally occurring titanium is composed of 5 stable isotopes; 46Ti, 47Ti, 48Ti, 49Ti and 50Ti with 48Ti being the most abundant (73.8 percent natural abundance). Eleven radioisotopes have been characterized, with the most stable being 44Ti with a half-life of 63 years, 45Ti with a half-life of 184.8 minutes, 51Ti with a half-life of 5.76 minutes, and 52Ti with a half-life of 1.7 minutes. All of the remaining radioactive isotopes have half-lifes that are less than 33 seconds and the majority of these have half-lifes that are less than half a second. The isotopes of titanium range in atomic weight from 39.99 amu (40Ti) to 57.966 amu (58Ti). The primary decay mode before the most abundant stable isotope, 48Ti, is electron capture and the primary mode after is beta emission. The primary decay products before 48Ti are element 21 (scandium) isotopes and the primary products after are element 23 (vanadium) isotopes. The +4 oxidation state dominates in titanium chemistry, but compounds in the +3 oxidation state are also common. Because of this high oxidation state, many titanium compounds have a high degree of covalent bonding. Although titanium metal is relatively uncommon, due to the cost of extraction, titanium dioxide (also called titanium(IV), titanium white, or even titania) is cheap, nontoxic, readily available in bulk, and very widely used as a white pigment in paint, enamel, lacquer, plastic, and construction cement. TiO2 powder is chemically inert, resists fading in sunlight, and is very opaque: This allows it to impart a pure and brilliant white color to the brown or gray chemicals that form the majority of household plastics. In nature, this compound is found in the minerals anatase, brookite, and rutile. Paint made with titanium dioxide does well in severe temperatures, is somewhat self-cleaning, and stands up to marine environments. Pure titanium dioxide has a very high index of refraction and an optical dispersion higher than diamond. Star sapphires and rubies get their asterism from the titanium dioxide present in them. Titanates are compounds made with titanium dioxide. Barium titanate has piezoelectric properties, thus making it possible to use it as a transducer in the interconversion of sound and electricity. Esters of titanium are formed by the reaction of alcohols and titanium tetrachloride and are used to waterproof fabrics. Titanium nitride is often used to coat cutting tools, such as drill bits. It also finds use as a gold-colored decorative finish, and as a barrier metal in semiconductor fabrication. Titanium (IV) chloride (titanium tetrachloride, TiCl4, sometimes called "Tickle") is a colourless, weakly acidic liquid which is used as an intermediate in the manufacture of titanium(IV) oxide for paint. It is widely used in organic chemistry as a Lewis acid, for example in the Mukaiyama aldol condensation. Titanium also forms a lower chloride, titanium(III) chloride (TiCl3), which is used as a reducing agent. Titanocene dichloride is an important catalyst for carbon-carbon bond formation. Titanium isopropoxide is used for Sharpless epoxidation. Other compounds include; Titanium bromide (used in metallurgy, superalloys, and high-temperature electrical wiring and coatings) and titanium carbide (found in high-temperature cutting tools and coatings). About 95 percent of titanium production is consumed in the form of titanium dioxide (TiO2), an intensely white permanent pigment with good covering power in paints, paper, toothpaste, and plastics. Paints made with titanium dioxide are excellent reflectors of infrared radiation and are therefore used extensively by astronomers and in exterior paints. It is also used in cement, in gemstones, as an optical opacifier in paper (Smook 2002), and a strengthening agent in graphite composite fishing rods and golf clubs. Recently, it has been put to use in air purifiers (as a filter coating), or in film used to coat windows on buildings which when exposed to UV light (either solar or man-made) and moisture in the air produces reactive redox species like hydroxyl radicals that can purify the air or keep window surfaces clean. Because of its high tensile strength (even at high temperatures), light weight, extraordinary corrosion resistance, and ability to withstand extreme temperatures, titanium alloys are used in aircraft, armor plating, naval ships, spacecraft, and missiles. It is used in steel alloys to reduce grain size and as a deoxidizer, and in stainless steel to reduce carbon content. Titanium is often alloyed with aluminum (to refine grain size), vanadium, copper (to harden), iron, manganese, molybdenum, and with other metals. Welded titanium pipe is used in the chemical industry for its corrosion resistance and is seeing growing use in petroleum drilling, especially offshore, for its strength, light weight, and corrosion resistance. Titanium alloyed with vanadium is used in the outer skin of aircraft, fire walls, landing gear, and hydraulic tubing. An estimated 58 tons of the metal is used in the Boeing 777, 43 in the 747, 18 in the 737, 24 in the Airbus A340, 17 in the A330 and 12 in the A320, according to the 2004 annual report of the Titanium Metals Corporation. Generally, newer models use more and widebodies use the most. The A380 may use 77 tons, including about 10 or 11 tons in the engines. 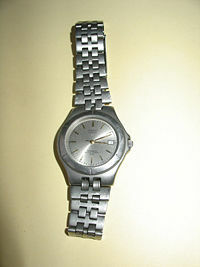 Use of titanium in consumer products such as tennis rackets, golf clubs, bicycles, laboratory equipment, wristwatches, wedding bands, and laptop computers is becoming more common. Due to excellent resistance to sea water, it is used to make propeller shafts and rigging and in the heat exchangers of desalination plants and in heater-chillers for salt water aquariums, fishing line and leader, and lately diver knives as well. Owing to its strength and inertness to seawater, as well as its substantial ore deposits in Russia, it was the principal material used in the construction of many advanced Russian submarines, including deepest-diving military submarines to date, Alfa and Mike class, as well as Typhoon class. Titanium tetrachloride (TiCl4), a colorless liquid, is used to iridize glass and because it fumes strongly in moist air it is also used to make smoke screens and in skywriting. In addition to being a very important pigment, titanium dioxide is also used in sunscreens due to its resistance to UV Radiation. Because it is considered to be physiologically inert, the metal is used in joint replacement implants such as hip ball and sockets and to make medical equipment and in pipe/tank lining in food processing. Since titanium is non-ferromagnetic, patients with titanium implants can be safely examined with magnetic resonance imaging (convenient for long-term implants). Titanium is also used for the surgical instruments used in image-guided surgery. Titanium blades are sometimes used in movies. Titanium ripping against titanium will produce blue, spectacular lightning and forging such weapon (which is hard and very expensive) may still end up cheaper than equivalent digital post-processing, especially for heroic fantasy movies. 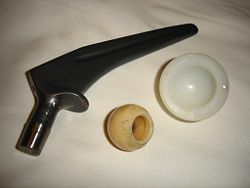 A titanium hip prosthesis, with a ceramic head and polyethylene acetabular cup. Its inertness and ability to be attractively colored makes it a popular metal for use in body piercing. Titanium has the unusual ability to osseointegrate, enabling use in dental implants. This ability is also exploited by some orthopaedic implants. Orthopaedic applications also take advantage of titainium's lower modulus of elasticity to more closely match the modulus of the bone that such devices are intended to repair. As a result, skeletal loads are more evenly shared between bone and implant leading to a lower incidence of bone degradation from stress shielding and periprosthetic bone fractures which occur at the boundaries of orthopaedic implants which act as stress risers. However, titanium alloys' stiffness is still more than twice that of bone, eventually leading to joint degradation. Titanium alloys are also used in spectacle frames. This results in a rather expensive, but highly durable and long lasting frame which is light in weight and causes no skin allergies. Both traditional alloys and shape memory alloys find use in this application. Many backpackers use titanium equipment, including cookware, eating utensils, lanterns and tent stakes. Though slightly more expensive than traditional steel or aluminum alternatives, these titanium products can be significantly lighter without compromising strength. Titanium cookware is available, and often more expensive than traditional cookware based on iron, copper, or aluminum. However, the thermal properties of titanium cookware can cause uneven heating without a well-distributed heat source, which may make it unsuitable for some culinary applications. Titanium has a high strength-to-weight ratio and shock-absorbing properties similar to steel alloys when used to manufacture high-quality bicycle frames. Titanium has a higher cost but has the advantage of corrosion resistance. Titanium is increasingly used in lacrosse stick shafts. Titanium is increasingly being used in cricket helmet grills. Titanium may be anodised to produce various colours. Titanium is also present in fireworks. Titanium comes in the form of foil, sheet, wire, granules, sponge, nanosized activated powder, powder, mesh, and rod. Titanium has occasionally been used in construction: The 150-foot (45 m) memorial to Yuri Gagarin, the first man to travel in space, in Moscow, is made of titanium for the metal's attractive colour and association with rocketry. The Guggenheim Museum Bilbao and the Cerritos Millennium Library were the first buildings in Europe and North America, respectively, to be sheathed in titanium panels. As a powder or in the form of metal shavings, titanium metal poses a significant fire hazard and, when heated in air, an explosion hazard. Water and carbon dioxide-based methods to extinguish fires are ineffective on burning titanium; Class D dry powder fire fighting agents must be used instead. Salts of titanium are often considered to be relatively harmless but its chlorine compounds, such as TiCl2, TiCl3 and TiCl4, have unusual hazards. The dichloride takes the form of pyrophoric black crystals, and the tetrachloride is a volatile fuming liquid. All of titanium's chlorides are corrosive. Titanium also has a tendency to bio-accumulate in tissues that contain silica but it does not play any known biological role in humans. ↑ Titanium: The Industry, Its Future, Its Equities (F.S. Smithers and Company, 1957), p 7, 33-67. The Columbia Electronic Encyclopedia. Titanium. Retrieved January 23, 2005. Encyclopædia Britannica Premium Service. Titanium. Retrieved January 23, 2005. Los Alamos National Laboratory. Titanium. Retrieved December 6, 2006. United States Geological Survey. Titanium Statistics and Information. Retrieved May 5, 2008. Van Arkel, A.E. and J.H. de Boer. 1925. Preparation of pure titanium, zirconium, hafnium, and thorium metal. Zeitschrift für Anorganische und Allgemeine Chemie. v. 148: p. 345-350. Metallurgy of Titanium and its Alloys, Cambridge University. World Production of Titanium Concentrates, by Country. This page was last modified on 10 December 2015, at 23:29.